Many a modern outdoor space features a hot tub or spa. They’re wonderful for relaxing after a long run, after a long day at work, or after a long lazy Saturday afternoon spent outside. Hot tubs and jet tubs are also great patio features. They bring water into the backyard environment and create a calming, but exciting, space. Hot tubs need covers, though! Covers help protect the finish of the tub, help keep unwanted critters from getting in there, and help ease the heating bill a little bit. They keep that tub at a cozy 104′ (or whatever you prefer!). Here we will review some of the options available, and we will determine the best hot tub cover. This article reviews several different hot tub covers Amazon currently supplies. A buyer’s guide is also included to help aid in evaluating the various styles, options, and features of different hot tub covers. If you’d like to jump right to our top choice among the best spa covers, head to the BeyondNice Custom Hot Tub Cover line. This cover is a heat cover and is of excellent quality. If you already have a foam heat cover and are looking for a weather cover, the Classic Accessories Veranda line of weather covers is a great choice! In this buyer’s guide section, we will walk through the most important feature distinctions of various hot tub covers, and find different ways to evaluate the importance of these features. There are two main categories of spa cover types: thick foam covers and thin fabric covers. Both serve different purposes and depending on your needs, you may be looking for either, or both, of these types of covers. Thick foam heat covers are generally custom-made to fit the exact dimensions of your hot tub. These are usually costly covers designed to insulate your hot tub and to help protect the tub from the elements. These heat covers can be the only cover you need, but you may want an additional weather cover as well. Thin fabric weather covers generally are designed simply to cover the tub to protect it from the elements and to secure it. Often (but not always) these thin weather covers sit on top of a thick foam cover and help to protect both the hot tub and the thick foam cover. Backyard hot tubs can be exposed to all sorts of weather, so you want a cover that is capable of protecting your hot tub from the elements, and (if you use it in the winter) keeping it insulated so that it’s toasty warm when baby, it’s cold outside! Spa covers blow in the wind, get abused by rain and snow, and get taken on and off frequently, so they need to be made of rugged materials. Examining the material quality helps to get a sense of what could rip, break, fade, or otherwise deteriorate over time. When not in use, a spa is generally covered. Consequently, when you’re in your backyard or on the patio, you are often staring at the hot tub cover as opposed to the tub itself. You want something that looks decent! Considering finish and color quality is helpful. Different cover manufacturers use various methods to secure the hot tub cover to the tub itself. Some use elastics, others use cinches, zippers, or other designs to make the cover hold to the spa. Evaluating the quality of these mechanisms is an important aspect of determining what hot tub cover will be best for your individual needs. Once you have your spa cover, you may want a spa cover lifter! Take a look at our spa cover lift reviews and buyer’s guide here. Keep in mind how the spa cover will be located relative to other spa accessories like spa tables and hot tub handrails. 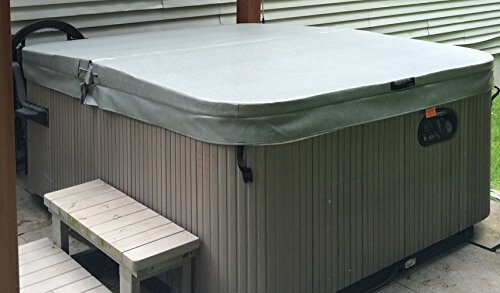 Here we will review several of the best rated hot tub covers found on Amazon.com, and examine the positives and negatives of each. To conclude, we will identify our favorite. First up is the BeyondNice Thickest Hot Tub Cover. It is the most expensive option on the list but offers several fantastic features that make it a great choice among heat covers the market today. BeyondNice custom-makes this cover to your dimensional requirements. You purchase this cover on Amazon.com through a unique system. After you buy, BeyondNice will contact you and get exact dimensions and requirements. It will make the cover and ship it to you in two to three weeks from receiving the dimensional specs! The BeyondNice hot tub cover is built with 6″ 1.0lb density EPS foam in the center, tapering down to 4″ along the edges. This design results in unparalleled insulation and heat retention properties, offering an R rating of 24.9 for great insulation. The thick foam also offers additional strength during those winter months. The tapered top allows rain and snow to flow off of the cover, protecting it and preventing excess weight buildup. Optionally, a flat cover is available as well. The cover weighs between 40-50lbs, depending on the size required. The BeyondNice can be custom made in any size, up to 96″ x 96″, or 96″ diameter in the case of a circular spa design. It is made of 26oz marine grade vinyl. The cover has a 6″ wide skirt for weather and UV protection, and if desired, four tie-down straps can be added. These lock the cover to the hot tub. The cover contains a polyethylene vapor barrier. This barrier keeps moisture from the tub from penetrating the unit and causing damage over time. The cover can fit existing hot tub lifts but is light enough that a lift is likely not needed. If you have an existing lift, you may want to get a reinforced center seam for additional strength. The reinforced seam is a small upgrade and is paid post-purchase. The cover features two nylon lifting handles, one on each side of the seam. Heat seals are located on each end of the seam. The cover is not strong enough to walk on in the default configuration. However, if this is a requirement, BeyondNice can add additional reinforcement to the cover to strengthen it for walk-over (also paid post purchase). It is made with 1.0lb foam, but if a stronger foam is desired, it is possible to upgrade to 1.5lb or 2.0lb foam for a small additional fee, paid after the original purchase. The BeyondNice really is beyond nice. It is a feature-full, extremely high quality hot tub heat cover, custom made to your requirements. It is an excellent choice for best spa cover. BeyondNice offers a five year warranty on this cover, which is always a plus! The Covermates Square Hot Tub Cover is a weather cover, and a much lower price point than the BeyondNice. It is a wrap cover made with either vinyl or polyester. The cover is available in three colors, either green, khaki, or tan. This is typically used as a cover for the foam heat cover, and is typically in conjunction with a thicker foam cover like the BeyondNice above for further protection of both the hot tub and the heat cover. It is water-resistant, bordering on waterproof. If you have an existing foam cover that is aging and starting to get some weather wear, but is still perfectly functional, the Covermates cover would be an ideal solution to get some additional time out of the existing cover. 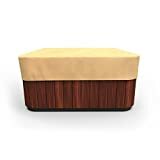 The Covermates Square Hot Tub Cover comes in two sizes, at 84″ x 84″ x 14″, and 96″ x 96″ x 14″. For materials, the green cover is made with 12 gauge marine vinyl, and the other two covers are made with 300-D stock dyed polyester. It has an elastic hem and an adjustable draw cord to cinch it tight when needed. There are occasional issues with water getting through the cover, but for the most part, the Covermates Square Cover keeps things dry. You should keep in mind the vinyl and polyester materials may react to water differently, depending on the model chosen. The Covermates is very sturdy. It has a solid, well made elastic, and is surprisingly thick. It is an excellent choice for a spa cover. The Budge All Seasons Hot Tub Cover is similar in style to the Covermates Square Hot Tub Cover. It is generally used as a cover to a cover. This is a protector and sealer for your main foam hot tub cover, like the BeyondNice reviewed above. 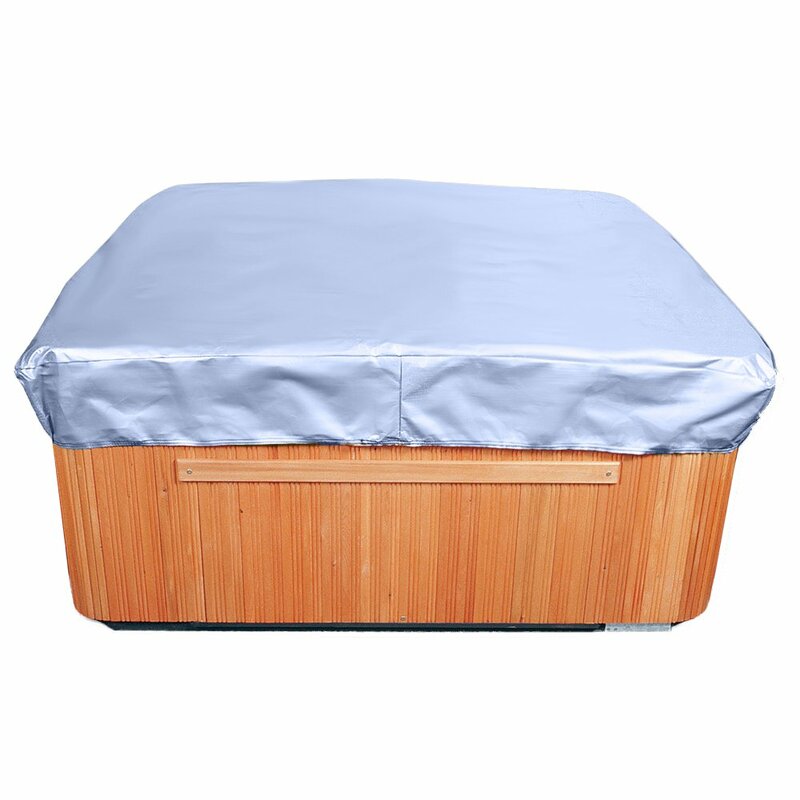 The Budge Hot Tub Cover is available in two color options: blue and tan. It comes in one size: 86″ x 86″ x 14″. It is made of polypropylene and is 100% PVC free. Ultrasonically-welded seams supply durability to this product. The Budge All Seasons is light weight, and easy to install and remove. The fabric made in three layers. The outer two layers are made of spun-bonded polypropylene, and are water resistant and UV resistant. The inner layer is made of a breathable but water resistant microporus material. This material is great at preventing sap, mildew, and outdoor debris from contacting the main hot tub cover, while allowing condensation to escape. The Budge All Seasons cover includes four sewn-in straps for attachment to the hot tub on days when it is extremely windy. The Budge All Seasons does seem to have problems with the waterproof material degrading over time, and becoming… water resistant. We advise you to be wary if water-protection is the primary requirement. The Classic Accessories Veranda Spa Cover is an interesting option for protecting and covering a spa. 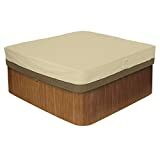 This cover is made of an attractive two-tone brown-beige color scheme, and would typically be used over a foam cover, depending on your needs. The Classic Accessories Veranda cover shown above will fit square hot tubs of dimensions of 94″ long by 94″ wide, though there are several different cover options depending on your sizing needs (see below). This cover is a special Gardell woven polyester fabric with water-repellent undercoating. It is designed to protect your hot tub, and likely your hot tub foam cover, from the weather and the elements. This cover provides extensive protection from UV damage and exposure from the elements. The fabric is waterproof and includes a protective dark splash guard skirt. Also provided are air vents, which reduce condensation build up from occurring on the inside of the cover, and protect against wind lofting. Padded handles allow for easy placement and removal of this cover. The Classic Accessories Veranda uses an elastic hem cord with a toggle to cinch around the hot tub and properly secure it. It can easily be hosed down when needed, and is quite easy to clean with a soft brush, mild soap, and water. This spa cover is available in several different dimensional options. Be sure to leave a few inches on each side to allow for room to tighten the cover around your hot tub. This cover is attractive enough that seeing a bit of the side will look good. The Classic Accessories Veranda spa cover line is a really high quality, and practical, option for protecting and securing your hot tub (and probably you hot tub heat cover as well!). It is attractive, functional, and comes in such a variety of sizes that it will likely fit whatever hot tub dimension you need. A much cheaper replacement than replacing your hot tub heat cover. After looking at these three options, we are certainly smitten with the BeyondNice system of custom hot tub cover supply. For that reason, we feel the BeyondNice Hot Tub Cover is the best hot tub cover.